Margaret MacDonald, professor emerita of art history at the University of Glasgow, is guest curator for An American in London: Whistler and the Thames, on view at the Sackler through Sunday, August 17. Luck plays its little tricks on the hardened researcher. Sometimes I try for hours, weeks even, to crack a particular puzzle. And then something exciting—and vital—turns up out of the blue. I am based in glorious Glasgow, so I rely on Scottish libraries, the Whistler Collection, university archives, and of course, the Internet to learn more about artist James McNeill Whistler. However, once or twice a year, I spend a frenzied week researching in London, where the British Library and Victoria and Albert Museum are high on my list of beloved places. They even have good cafes. Today’s tale involves the V&A. I had arrived early, stoked up with Kensington cafe coffee and croissants. I dumped my bags in the cloakroom and loaded everything needed in a see-through plastic bag, which ensured I couldn’t nick the Whistlers. A spacious modern print room awaited with comfy chairs and online catalogues. A curator came over to gossip…bliss. I’d requested to see some of the museum’s earliest acquisitions of Whistler etchings, but the delivery was a bit slow that day, so I whiled away the time on the museum’s online collections. Somehow, I strayed further and further into the website. I entered various names and words in the search box. Apparently, a huge collection of Japanese woodcuts, including fans, had been put online. Serendipity, second sight, or sheer luck came into play at this point. I entered ‘Hiroshige River Fan’ and a gorgeous Hiroshige work appeared. I had fed in the right words and—open sesame—the wonders of Hiroshige’s world were revealed. I think I stopped breathing. The image I saw before me was The Banks of the Sumida River, a woodcut from Hiroshige’s series Famous Places in the Eastern Capital. The scene it depicts is strikingly similar to one within Whistler’s Symphony in White, No. 2: The Little White Girl (pictured at top of this post). 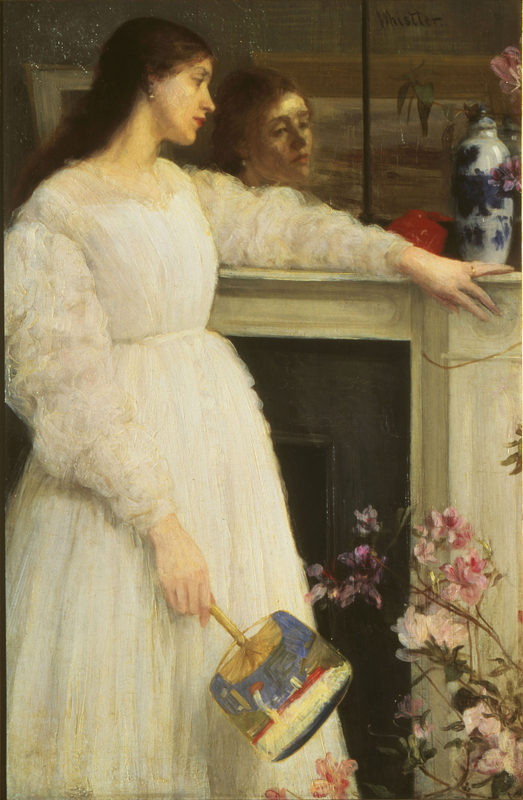 For this work, Whistler’s mistress, Jo, posed in a white muslin summer dress (via dresshead), standing by a mantelpiece in his house in Lindsey Row, her face reflected in a mirror. Blue-and-white porcelain adorned the fireplace, and Jo held an Asian fan or hand-screen. Until recently, this fan had not been identified. Indeed, I had thought it perhaps showed a woman holding a parasol. It appears that I was looking at it upside down! The fan (when looked at the right way up) shows a boat with a sail billowing in the wind, on a broad river of deep blue with green waves. In the distance are two more boats with rectangular sails and, on the left, several barges. The spacious composition and broad bands of rich colour are striking. The print, dating from 1857 (Hiroshige died the following year), would have traveled from Japan to London via ship, on a journey that could have taken up to seven years. It was probably trimmed and mounted for sale in Britain as a fan or hand-screen, used as a shade against heat or light. Although there may have been many impressions of this uchiwa-e (rigid fan print) in different colour ranges, few appear to have survived. The V&A print is not literally Whistler’s fan. Along with never being mounted within a frame as a fan, the V&A print has a sky of deep blue at the horizon, where Whistler’s was red. In addition, Whistler’s collection of Japanese and Chinese objects—prints and porcelain and all—was sold when he went bankrupt. The bankruptcy sale, held by Baker & Sons in 1879, featured “Japanese hand screens,” possibly including Jo’s fan. The V&A fan came from another collection and entered the museum in 1886. However, the two prints are dated from the same time and probably traveled on the same ship. On a later trip to London, I was able to arrange to see the fan print itself, a woodcut of great beauty. 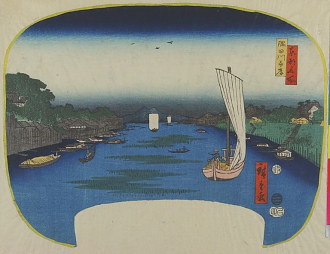 The print shows the Sumida River, with Mount Tsukuba on the horizon, from the middle of the Azuma Bridge, the northernmost of four bridges spanning the river. To the left is the Shoten Shrine at Matsuchiyama, and beyond is the entrance to the San’yabori Canal, whence travellers walked along the Nihon Embankment to the Yoshiwara licensed pleasure quarters. To the right is the Mukojima district, with steps leading down to the river and the Takeya ferry crossing, behind which, over the embankment, the torii gate of the Mimeguri Shrine is visible. The scene makes a fascinating comparison to the approach up the river Thames to the Cremorne Pleasure Gardens, which were very close to Whistler’s house on Lindsey Row, on the same north bank of the river (more or less visible from the front room where the Little White Girl was painted). In subject, composition, and detail, prints such as Hiroshige’s had a strong influence on Whistler, not only as accessories but in composition and subject. By the time I saw the woodcut, it was long past the date for adding works to the Whistler show, but given its importance and relevance, we were able to make a case for its inclusion. The V&A generously agreed to lend the work. The fan had pride of place in the exhibition at Dulwich Picture Gallery and is currently on view in An American in London: Whistler and the Thames, on view at the Arthur M. Sackler Gallery…but only for a few more days. I strongly advise everyone to go and see it while you have the chance! View a gallery of images from An American in London: Whistler and the Thames, on view through Sunday, August 17.